Police officers at Voi Police Station were Monday forced to scamper for safety after a lone rogue elephant stormed through the station as the animal fled from rowdy bodaboda riders who were chasing it. 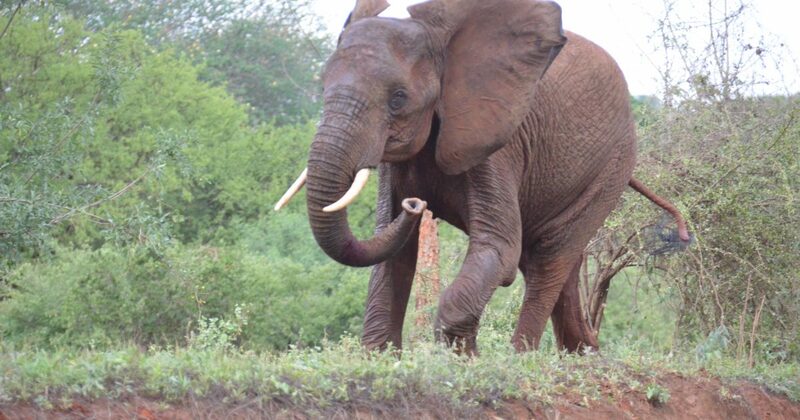 The jumbo had strayed from Tsavo East National Park Sunday night and wandered at Mwakingali village. Early Monday morning, word went round about the elephant and hundreds of villagers came out to see the animal. The jumbo panicked and fled towards Voi town with dozens of excited bodaboda riders hot on pursuit. Efforts by Kenya Wildlife Service (KWS) to warn members of public to keep off the animal fell on deaf ears as more curious onlookers gathered in the streets to have a glimpse of the mammal. The jumbo rambled through the Moi stadium in Voi town before menacingly ripping through the fence of Voi Police Station. Officers outside the station ready for the morning duties fled inside the building. The jumbo charged through the facility and later went to hide in the thick bushes inside the compound. Voi police boss, Joseph Chesire said the lone elephant passed through the station searching for its way back to the protected area. He added that it was fleeing from the noises and crowds following it. “It came through here but later went out. There is no harm caused as everyone is safe,” he said. 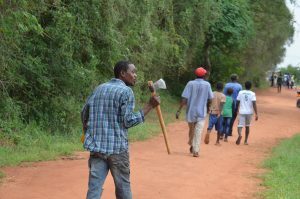 The elephant later hid at the thick bush around Voi public cemetery where hundreds of residents flocked to have a look. Most were armed with axes, pangas and sacks in anticipation that the jumbo would be shot dead. However, KWS team led by senior warden Community service Zainabu Salim repulsed the members of public who were making the jumbo jittery. Later, police were called in as reinforcement to chase away the crowd to allow space for the jumbo to be shepherded back to Tsavo East. Disappointed villagers accused the police and KWS of denying them an early Christmas meal. Mr. Alex Ngau, a bodaboda rider, said there was a reason the elephant had wandered in their homes just when Christmas was around the corner. He added police and KWS had no business taking away their gift. “This was Christmas gift brought by our prayers. It is wrong to take it away,” he lamented. 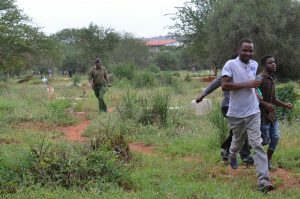 However, Mr. Chesire warned the public to be keeping away from wild animals especially if they strayed from the park. He said tragedies might occur and said it was important to give KWS and police time to do their work. “We chase you to keep you safe. It’s not malice or hate. It is for your own good and safety,” said the OCPD.